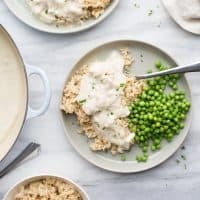 Creamy Cauliflower Tuna on Rice! 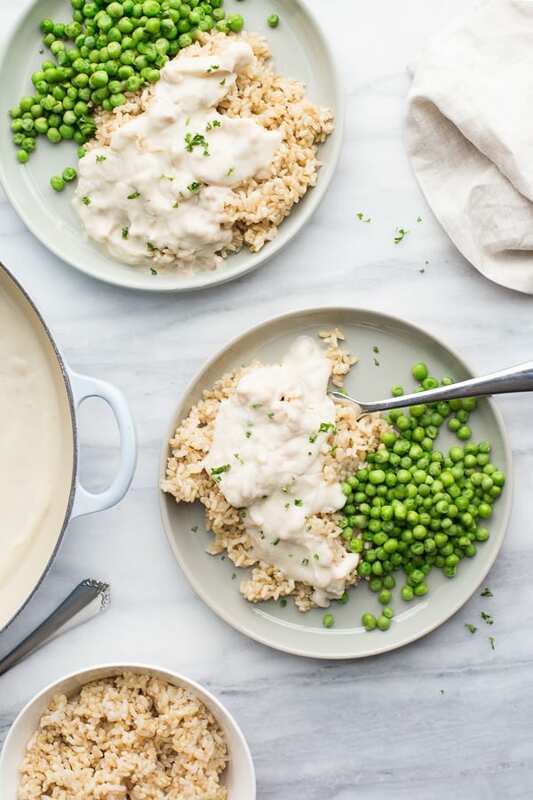 A comfort-food favorite made healthy with creamy cauliflower sauce. 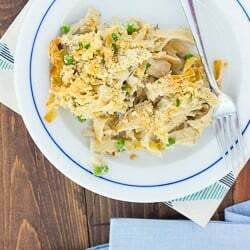 Easy, kid-friendly and delicious! Growing up, one of my Mom’s go-to dinners was Creamed Tuna on Rice. It was one of those last-minute, what-can-I-make-from-the-pantry kind of meals. 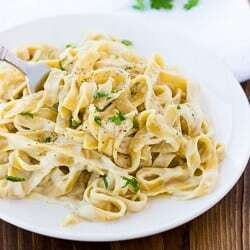 Her recipe had a creamy, milk-based white sauce and canned tuna. 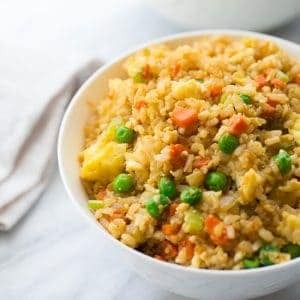 We always ate it over rice with a side of peas. Years later it’s one of those meals that still sounds comforting and cozy to me! Enter Creamy Cauliflower Tuna on Rice. This recipe is a healthier, lighter and dare I say more delicious take on tuna on rice than the dish I grew up eating. I think creamy cauliflower sauce is the best thing to happen to tuna in a long time! I’m always looking for ways to eat more cruciferous vegetables and cauliflower sauce is something my whole family loves. I think it’s even easier to make cauliflower sauce than a traditional white sauce. I like to saute some shallots and garlic for flavor, then add cauliflower and chicken stock. I also add in some raw cashews while it simmers so when the sauce is blended up it’s extra creamy. Raw cashews in sauces are a great way to keep creamy sauces dairy-free! 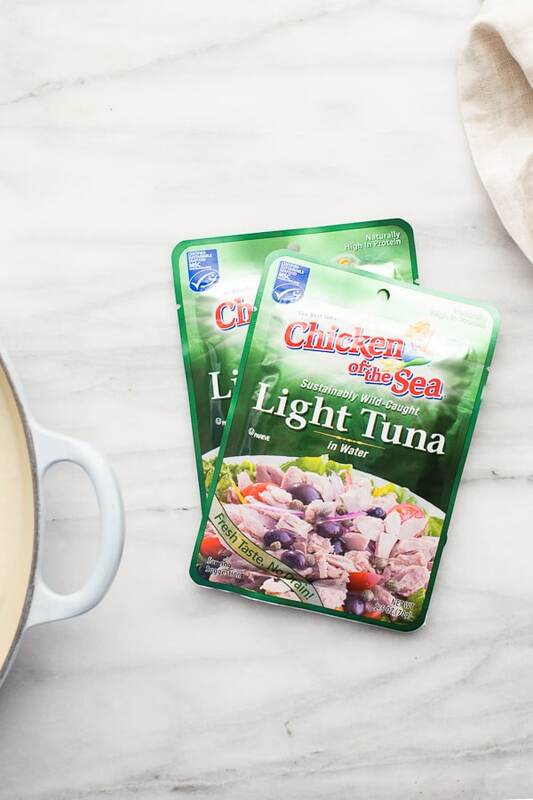 Adding some canned or packaged Chicken of the Sea Chunk Light Tuna is the perfect way to add some healthy protein and omega-3s to this meal. 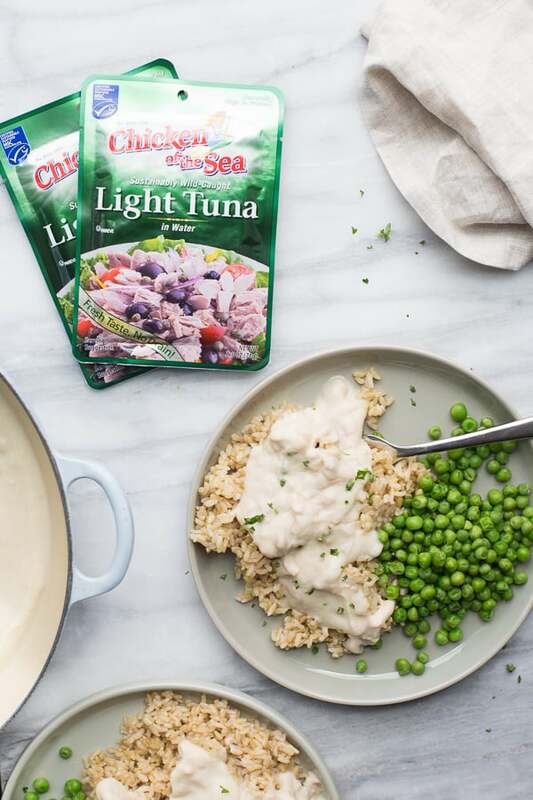 I’m really picky about what kind of seafood I’ll buy and Chicken of the Sea Tuna is certified by Marine Stewardship Council (MSC) – the world’s leading certification standard for sustainable, wild-caught seafood. The MSC is committed to creating well-managed ocean fisheries to ensure the long-term sustainability of fish stocks and healthy marine ecosystems. 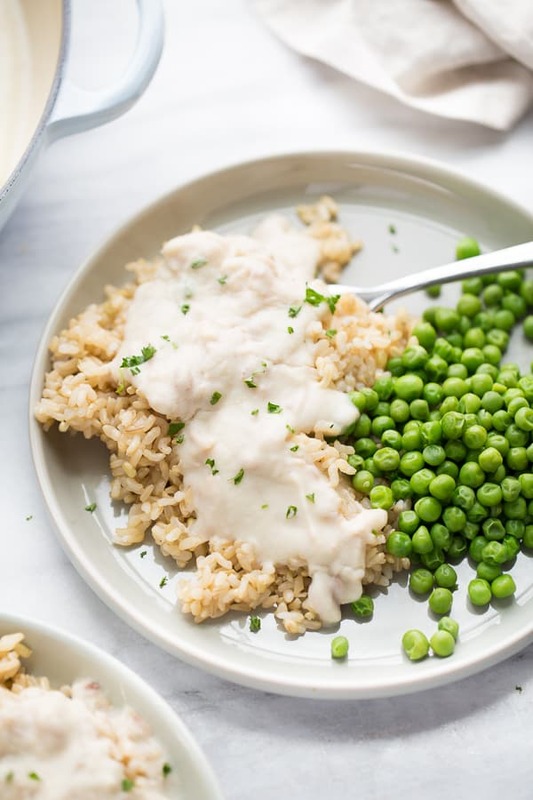 I serve the cauliflower tuna sauce over brown rice that I cook in my instant pot along with a side of peas – just like growing up. It makes for a satisfying, delicious and kid-friendly dinner! In a large saucepan set over medium heat, add the olive oil. Add the shallot and garlic and cook until softened, about 5-6 minutes. Add the cauliflower florets, chicken stock, salt and cashews and bring to a simmer. Cover and simmer until the cauliflower is fork tender, about 10-12 minutes. Transfer the cauliflower and chicken stock mixture to a blender. Carefully blend until completely smooth. Pour back into the pan and add the drained tuna. Season with salt and pepper to taste. Serve over hot cooked rice. Enjoy! Can I save left overs? Or should I cut receipe in half for two people? The leftovers will save great!